Rajkumar''s Supari Tukda Machine or Betel Nut or Areca Nut Cutting Machine is well suitable to be used worldwide. Rajkumar Agro Engineers Pvt. Ltd. looks forward to cater to your needs. For more details, please drop in an inquiry, with your full name, complete address and contact information. Rajkumar Supari Tukda Machine or Betel Nut or Areca Nut Cutting Machine is an innovative product which can cut the Betel nuts into small pieces of 5mm. Electric Motor of 1.5 HP, Single Phase and 1,440 R.P.M. is utilized. The Capacity would be 20-30 Kg/hr. 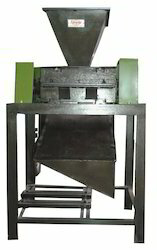 Rajkumar's Supari Tukda Machine or Betel Nut or Areca Nut Cutting Machine is well suitable to be used worldwide. Rajkumar Agro Engineers Pvt. Ltd. looks forward to cater to your needs. For more details, please drop in an inquiry, with your full name, complete address and contact information. Looking for Supari Tukda Machine ?